Workflow is how you get your work done. The steps you take to process the documents you receive and deliver internally; or the documents you produce and deliver to the USPS or other carriers. It’s always best to map out your processes, before you plan the physical space. Whenever possible, workflow should be clockwise. Most people are right-handed, they read left to right, etc. Place work areas in the appropriate proximity to the entrance and exit. When you finish, the work should be as close to the exit as possible. Make sure that you separate functions into different and clearly marked areas. Ergonomics comes from the Greek “Ergon” – work and “nomos” rules – for work rules. Most people first became familiar with ergonomics in the 90s, with the increase in repetitive stress injuries caused by keyboarding. However, the principles have been around for many years, especially in factories. Managers should work with design experts who can assist with establishing work areas that maximize neutral posture, while minimizing awkward lifting. A neutral position is one that provides the most strength, most control and least stress on joints and tissue. Tables, counters and shelving should be designed so employees avoid high and low lifts, pulling, twisting and reaching. Procedures should reinforce the use of lift assists, power grips, sliding, using 2 hands, and keeping objects close to the body. Contact stress can be caused by equipment and other surfaces. Proper positioning of the equipment and operator are key. Consider having your team warm-up and stretch before starting work. One client has worked with their employees and HR to develop a stretching routine for their employees. Every shift – inbound and outbound – all employees – including supervisors participated. And when I was visiting – consultants participated too! It’s also important to pay attention to the environment. Paper and equipment need the climate to be consistent. The temperature should stay between 64 and 75 degrees Fahrenheit. Relative humidity should be maintained between 40 and 60 percent. Invest in a wall monitor that displays and records temperature and humidity readings. Report any significant fluctuations to facilities management, and schedule quarterly meetings to discuss any improvements. Limit exposure to the weather. Keep equipment at least 20 to 30 feet away from any external doors. Consider building vestibules or enclosed loading docks to prevent direct exposure to the work area. While an added expense in construction, the improved performance will pay off the investment. Safety must be paramount. As consultants, we’ve had the pleasure to work with several utilities over the last 17 years. Of all our customers, their culture is based on a “safety first” approach. Including making sure all paths are clear and work areas are clean – including wiping up spills as soon as they occur. You may also want to consider contacting your workers compensation insurance carrier to conduct a work area risk assessment. For no charge, they’ll send a specialist to evaluate the workspace, including ergonomics, pathways and noise levels. Important to note – in most cases, you’ll be required to implement the recommendations, or you may see your insurance premiums increase, or your policy cancelled. Security is an area that many mail centers are still not focusing on enough. 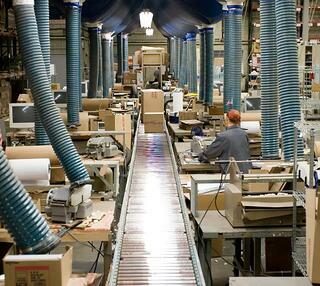 Whether an inbound or outbound operation, the work in the mail center contains confidential customer information. Furthermore, employees must know how to respond in an emergency. When integrating security into your design, ensure that access to the operation is limited to the appropriate staff. Install cameras at all entry points and storage areas. Evacuation plans and rally points should be marked and displayed in multiple areas. Alarms, fire extinguishers and phones must be accessible at all times. For the immediate future, paper will retain its importance as the preferred method for receiving bills and statements. Physical mail is an essential component in integrated marketing campaigns. Take the time to design the best work area to process this critical communication product.